Today I found out Harry Houdini piloted the first controlled airplane flight over Australia. Houdini initially became fascinated by aviation in 1909, purchasing a French Voisin biplane for $5000 and subsequently hiring a full time mechanic to maintain it. In his first flight attempt, he crashed the plane, but with the help of his mechanic, fixed it up and made a successful flight on November 26 in Hamburg, Germany. One year later, in 1910, Houdini agreed to travel to Australia, something he had previously sworn never to do because of the long boat ride (he was prone to sea sickness) and the distance it would place him from his family. For the journey, he brought along his biplane and made the first controlled powered flight in Australia on March 18, 1910, north of Melbourne at Diggers Rest, Victoria. The flight lasted only one minute, due to the weather being slightly unsafe at the time. Later in the day, he made two more flights, the first nearly crashing, due to a side wind, and in the second managing to fly for three minutes. A few days later, he managed a flight that lasted seven minutes and 37 seconds, which was quite an impressive length at the time. Shortly before Houdini set the record, a rival pilot, Ralph C. Banks, showed up and attempted to be the first to make a controlled, powered flight over Australia, but ended up crashing his plane due to poor weather conditions, which is why Houdini had not yet tried to fly. Up to this point, Houdini had left his plane only to do his performances in Melbourne and otherwise slept under his plane, waiting for a window to fly the plane when the weather was just right. 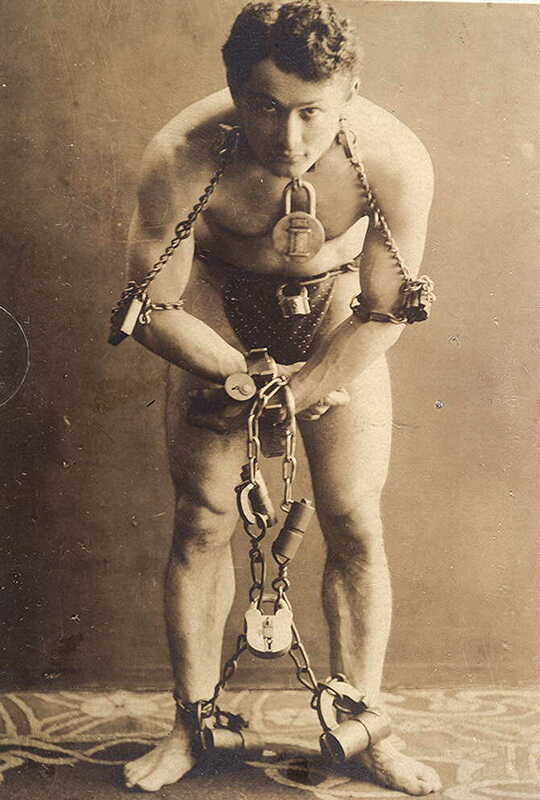 In the early part of his career, Houdini often performed as a Wild Man in circus shows. Wild men were sideshow acts where the performer would do crazy things, such as bight the heads of live animals. “Wild men” were also where the word “geek” came from. Houdini’s fame initially came about due to his ability to escape various types of handcuffs and other restraining devices. During WWI, Houdini took an entire year off performing and voluntarily gave up several of his tricks for escaping handcuffs; teaching these tricks to soldiers, just in case they got caught by enemy troops. A 19 year old mechanic from South Australia stated that he flew a plane before Houdini in Australia in a Bleriot XI monoplane on March 17, one day before Houdini. However, the one supposed witness of this flight, Frederick H. Jones, later admitted that they had made the whole thing up. Houdini and his wife Bess agreed that if Houdini’s spirit could come back to Earth, that she would know it was him because he’d say “Rosabelle believe”, which was a phrase from a play that Bess was in when the two first met. For 10 years after that, she held regular séances on the roof of the Knickerbocker Hotel on Halloween. She finally gave up saying “ten years is long enough to wait for any man.” However, this tradition has carried on amongst various fans of Houdini to this day, though obviously in varied locations. It is sometimes suggested that Houdini was encouraged to make the flight over Australia by a British friend, Lord Northcliffe, who wanted to showcase flying to the British as a way to suggest the military potential of airplanes. He felt that having a celebrity pilot the plane would provide the necessary exposure.